As you are aware, the Code of Student Conduct and appropriate consequences related to violations of the code are clearly spelled out in the Student Handbook, which was sent home during the first week of school and can be found on our website, www.aacps.org. 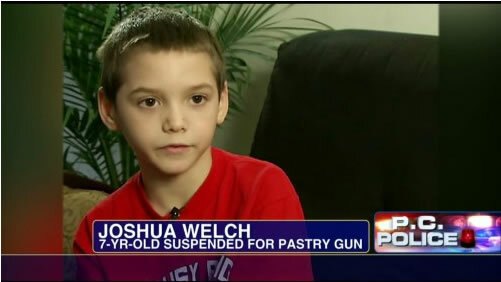 Yes, let us discuss the mental devastation of dastardly pastry weaponry with our children, shall we? Thankfully, the strawberry pop tart in question was destroyed before it could cause any further harm to the most vulnerable among us. This, unfortunately, is not an isolated incident. It is instead just another example in a long list of examples of disturbing reactions to children simply being children currently unfolding all across the nation. Now as "scary" as pop tart guns, tiny action figure plastic weapons, pointy "finger guns," and invisible pretend grenades may be to school administrators (who apparently don't remember what it was like to be a child) their reactions to such child's play makes them an amazing embarrassment to themselves as well as to society at large. I think we can all agree that no lives are saved, no tragedy averted, and no additional aura of safety added to a school campus by such classroom clampdowns. In this hyper-sensitive, progressive, nanny-state world where we are afraid of shadows and the innocent actions of small children one can only wonder what ever happened to logic and common sense. It is not this poor child with a twinkle of an imagination that needs counseling or punishment, but the principle and a teacher who made this into more than a five second incident. A stern "Josh, sit down and eat your food" would probably have been sufficient but no, not in "let's scare the public that all guns are bad" overreaction land. In this era of symbolism over substance sound thinking is really the only casualty in the classroom in this type of situation. These same finger-wagging administrators should have seen my childhood toy gun collection, not to mention the full scale battles we waged at recess in elementary school. When I was a child playing full blown WAR at recess was normal and nobody gave it a second thought. We played Army, Star Wars, and staged epic reenactments of civil war battles during recess. We even had officers and ranks. Often such playground clashes were elevated to class on class warfare. The fifth graders would wear their Boy Scout shirts on a certain day and be the Union, and the sixth graders would play the Confederates. If your position was "overran" you might get roughed up a bit but such play consisted mostly of the trading of volleys followed by Gettysburg like charges. It really was great fun. I think even pastry kid would have enjoyed it. Can you imagine the hysterics such a scene would cause today? "Little Billy Yank pretended to shoot a musket at little Johnny Reb at Barack Obama Elementary School today, full story at eleven." How things have changed in such a short amount of time. And while it is easy to write such paranoia off to nervous ninnies and worry-wart weenies, the other alternative is perhaps even more frightening. A comment by JCM (http://twitter.com/JCM1776) suggested the following. This is not stupidity, laziness, on the part of school. This extreme intolerance of an everyday object has a purpose. When this generation comes of age, disarming then enslaving the population becomes a breeze. Now that is more frightening than any misshaped pastry could ever be. Perhaps the school would just have been happy if little Josh had merely stated that he was transgendered and wanted to go change with his female classmates in the girl's locker room. For that type of behavior is being strategically fast-tracked as normal and protected while at the same time playing with your government funded pop tart is not. Progressivism is indeed a confusing and detrimental disorder, and the proof is all around us. In the end, Josh's father said "I'll just call it insanity, it's a pastry." I couldn't agree more. David Huntwork is a conservative activist, blogger, and columnist and the proud father of three daughters. The son, grandson, and great-grandson of Ministers of the Gospel he brings a unique blended background of theology and ideology to the great debates of the day. He believes that Faith, Family, and Freedom is the formula for success and the key to a good life and a healthy nation. David blogs and serves as the site editor for Constitutionclub.org. You can contact him at Davehuntwork@juno.com.